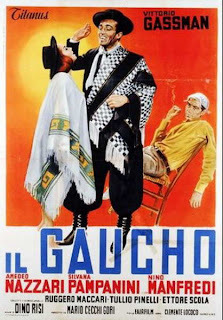 IL GAUCHO (THE GAUCHO: 1964), written by Scola, Maccari and Tullio Pinelli and shot in Argentina, puts Gassman in the role of a press-agent full of debts who tries to make money in Buenos Aires and utterly fails, returning to Italy empty-handed. IL TIGRE (THE TIGER: 1967), with a script by Age and Scarpelli, recounts the emotional crisis of a forty-year old who falls in love with a young, but not exactly innocent little girl (Ann-Margaret). 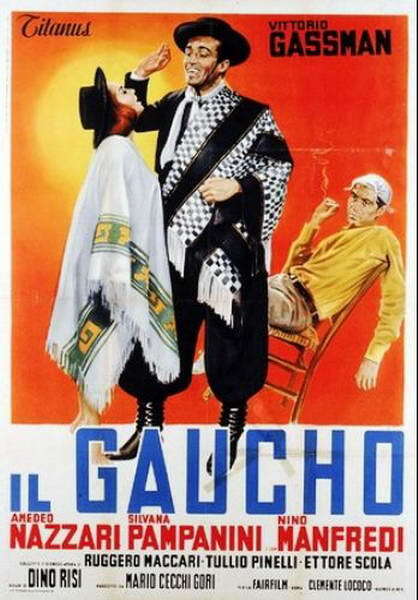 IL PROFETA (THE PROPHET: 1968), on a script by Scola and Maccari, relates the ironical parable of a sort of hermit who has abandoned the city, his family and his profession and, because of the success of his "personage", is led to give up his act of protest, letting himself get tangled up with women and money, until in the end he opens a restaurant. These are three examples of the way the director Dino Risi succeeds in administrating Gassman's box-office popularity with films that are at once enjoyable and sustained by ideas. But Risi tends toward comedy the moves more and more towards the dramatic film and comes up with an excellent PROFUMO DI DONNA (FRAGRANCE OF WOMAN), from a story by Giovanni Arpino about a trip through Italy of a blind officer accompanied by a young soldier. Incidents and accidents lend a humorous touch to the story, until one realizes what the unspoken purpose of the trip is: the officer, destroyed more psychologically than physically by his blindness, has decided to commit suicide, but will be saved by the love of a woman. One of the most mysterious and harrowing novels by Arpino supplied Risi with the idea for ANIMA PERSA (LOST SOUL: 1976) in which a young man gradually discovers, in a Venice full of enchantment, depicted outside the usual tourist cliches, a double life of his uncle, an incorrigible gambler by night, a would-be office-worker, actually a lunatic locked up at home, during the day. In CARO PAPA (DEAR DAD: 1979), Gassman is instead a parent grappling with the drama of lots of people who discover they have a child who has passed from dissent to terrorism.